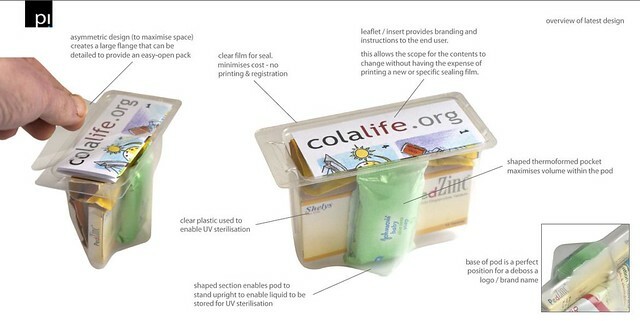 The Friday before last (27/1/12) a package arrived at the ColaLife project office containing the first prototype of the ADK packaging from our packaging partner PI Global. Earlier in the week, during a much anticipated Skype call, PI Global presented the prototype to us with supporting 3D images and the movie below showing the how the ADK would be assembled. Because of their shape you can almost ‘throw’ the ADK at a crate of bottles and they settle in the right place – inserting the wedge-shaped AidPods was a lot more fiddly. The branding is carried on the insert that goes under the lid. The branding is not integral to the packaging itself. This means that we can produce a whole variety of brand options for the focus group work and can respond properly to the outputs of the focus group work to produce a brand that mothers will find attractive. The package looks attractive and the contents can be seen without opening the package. As you can imagine, we are all pretty excited about this new AidPod, but it is still a prototype. There is still a bit of work to do to broaden the compatibility of the packaging with all the possible combinations of crate and bottle types and the re-usable lid still has to be designed. So, PI Global have delivered beyond our expectations and on time. This has been a great motivator to other partners as the project gets underway. We have had great difficulty holding on to the 10 samples we have because everyone wants one! A good sign. Brilliant! I’ve been following the development of the Aidpod for quite a long time now and, as a graduate product designer (now working in marketing), I’m genuinely impressed by the jump forward with this design. Well done PI and Simon!